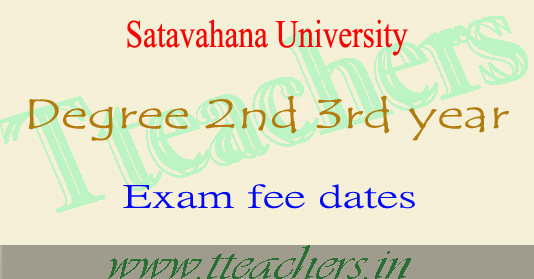 Satavahana university degree 2nd 3rd year fee structure & last date 2016-2017 : Satavahana University has been issued notification of degree 2nd year 3rd year exams fee due dates for the academic year 2016-2017 . Degree 1st, 2nd and 3rd year UG annual exams of B.A(L) B.A. B.B.M. B.Com B.Sc courses to be held in the month of March/ April 2017. Under Graduate students who have appear,those candidates may submit the application along fee before last date 10th January 2017. NOTE: The College Managements are reguested to get the DO's from the Sank's of SSH, SSI & Andhra Sank only. " NOTE: Online Fee particulars for II & III year (Regular) should be shown Course wise on College Letter Head. " 1. In case of late registration and submission a separate penalty of (Rs. 5000/-) per day for each semester should be remitted. 2. Application form(s) will not be accepted directly from any candidate or from the Principal after the due date. 3. The students can obtain application forms from their respective colleges. 4. Fee once remitted will not be refunded or adjusted under any circumstances. Therefore, the candidates should confirm their eligibility by going through the rules and before the remittance of examination fee. 5. In case of transfer of students from one college to the other, transfer orders should be enclosed with Nominal Rolls. 6. The date of Commencement of Examinations and the detailed Time-Table will be notified in due course. 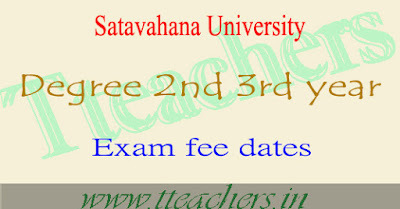 The application forms may be obtained from the Examination Branch, Satavahana University, Karimnagar on payment of prescribed amount for offline students. i. 2 hard copies of nominal rolls in the prescribed proforma. ii. No dues certificate from Dean, College Development Council, S U. iii. No dues certificate from Dean, Academic Affairs, S U. 4. The candidates with late fee ofRs.500/- should be directed to remit the examination fee and late fee' directly in the form of D.O. drawn in favour of "The Registrar, Examinations PJc. SU . Fee remitted in other modes and applications sent after the prescribed dates will not be accepted under any circumstances and will summarily be rejected. Late fee (Rs.500/-) forms should be submitted to the Controller of Examinations on-or Before 24-01-2017, through college nominal rolls. 5. Every application must possess a receipt of payment issued by the college towards examination fee collected from the candidate, (Except late fee of Rs .250 l­ and Rs.500/- forms) failing which it will not be accepted. 6. Application forms should be scrutinized and signed by the Academic Coordinator of the college in accordance with the guidelines and instructions issued and should be tied separately in chronological order. Applications of not eligible candidates are liable for rejection at any stage whenever they are detected. For this, the University will not be held responsible in any manner. 7. Payment of fee must be in the form of consolidated Demand Draft Course Wise only. Any other mode of payment is not accepted. 8. The application forms of the candidates who have put in the required percentage of attendance only to be forwarded to the University. 10. An updated Faculty 0 a ta in the prescribed proforma should be submitted for UG Annual Examinations - 2017.
ii) with late fee Rs.250/- 19-01-2017 & with late fee Rs.SOOI-23-01-2017.